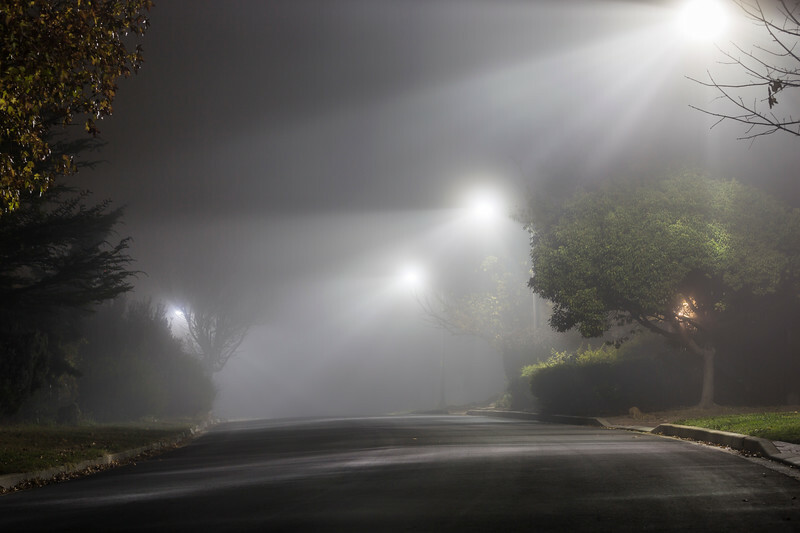 An important warning when taking photos outside in foggy weather is to beware of condensation. 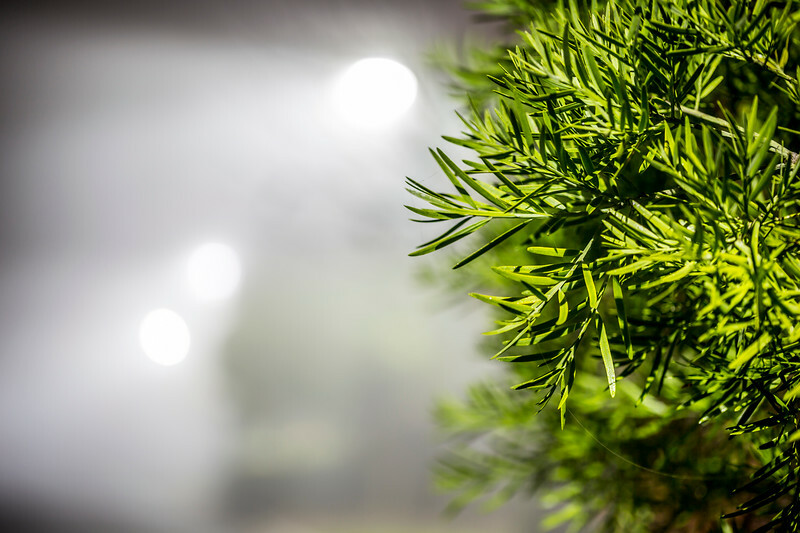 Water condensation will form on the surface of your lens or even inside your camera. If your camera is at a similar temperature as the air and the fog it not too dense, then condensation might not be a problem at all. I used a cloth to regularly wipe off the front of my lens. I used a Canon 5D MkIII and Canon 24-105 L lens that is weather sealed so I was not too worried about condensation. Everyone loves photos with light rays in them. 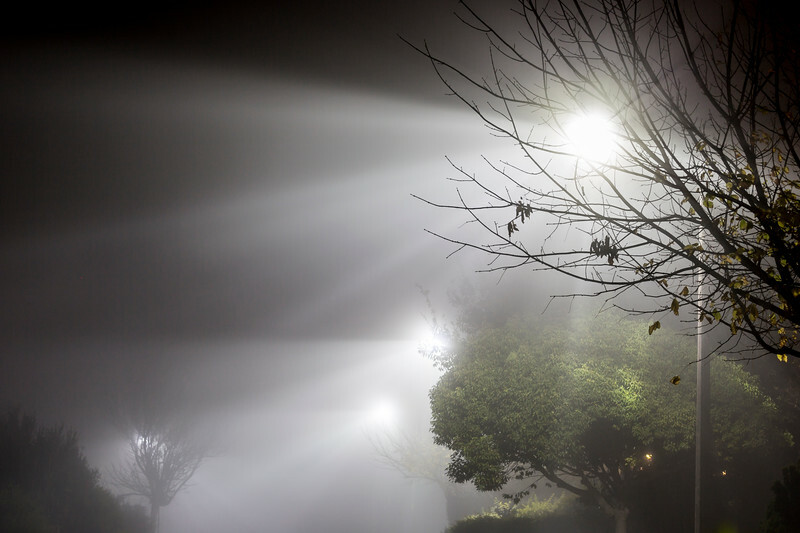 Foggy conditions can create light rays through the trees and enlighten the photo. 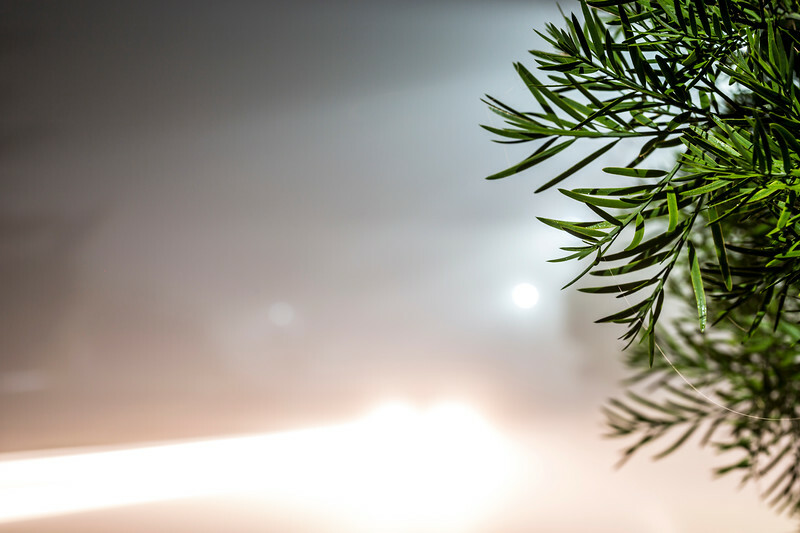 Light rays can come from natural light or man made lights. In my photo with light rays the light rays came from a street light. In general, the closer you are to the light source the more pronounced the light rays will be, as long as the source of light stays at the same angle as the camera. 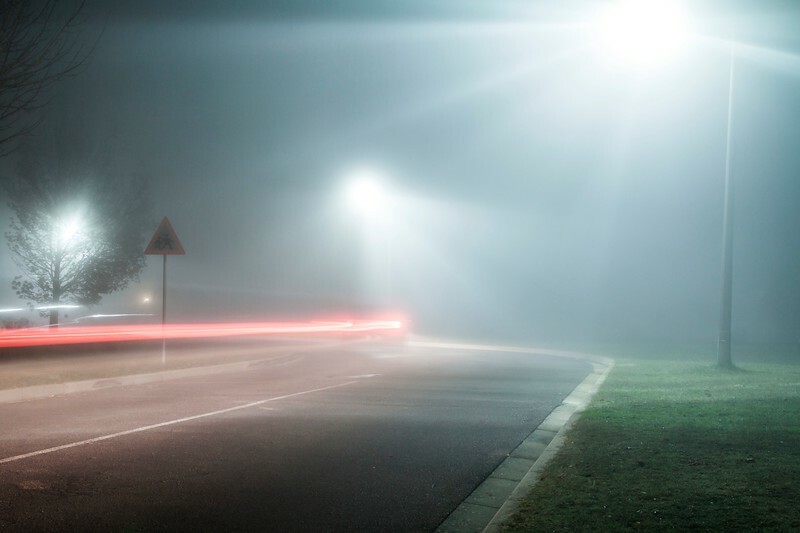 Fog reduces the contrast of a scene dramatically. It is ideal for landscape photos. For best results I would recommend shooting in RAW. There is a much more leniency in changing the exposure in post-production and most importantly the white balance when shooting RAW. 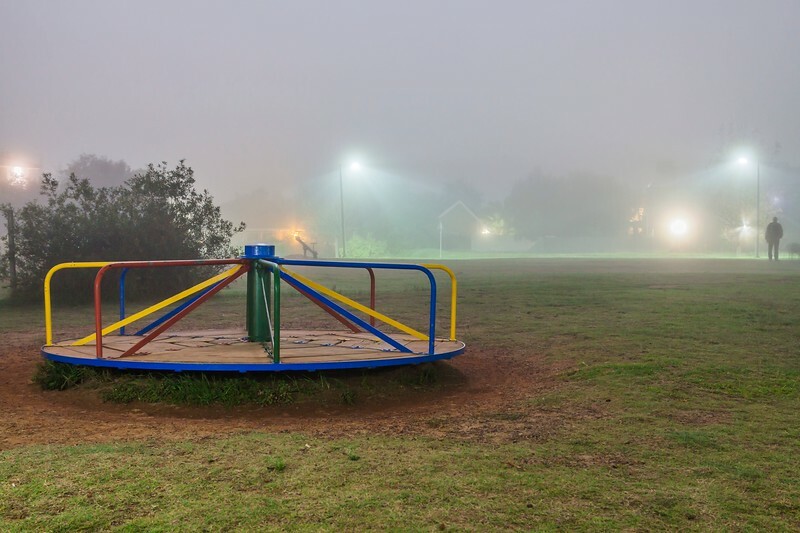 The auto white balance (AWB) can easily be fooled by fog. Adding a slightly blue cast to the images can enhance the mood of the photos. 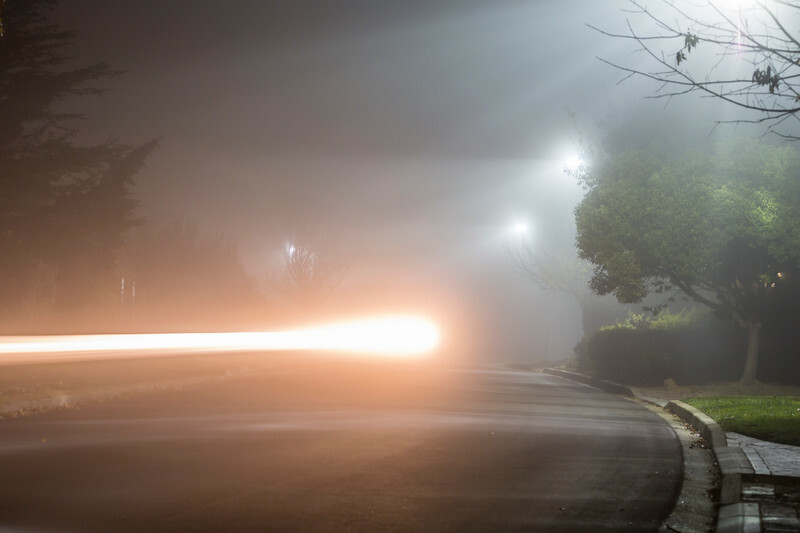 It is usually required to use a tripod when photographing in foggy conditions. Without adding noise to the photo you wil usually get an exposure that is too long for hand held photography. In my case it was at night and only a little bit of lights from the street lights. As always when using a tripod, remember to turn off optical stabilisation. 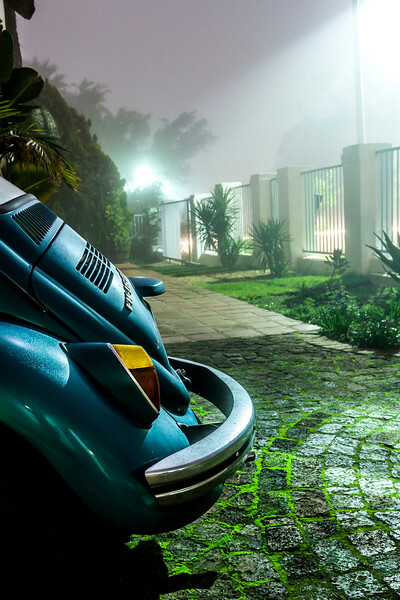 A green VW Beetle's back in the driveway on a foggy night. The moss on the pavement has a green glow from the street lights that are diffused by the fog. The photo was taken in March 2013 with a Canon 50D.